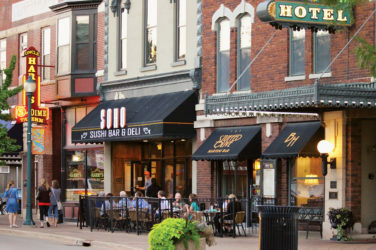 A land of limestone cliffs, scenic byways and caves is unlike any other place in Iowa. Explore it by car, on foot or on the water. Above: A view looking north from the Blackhawk Bridge near Lansing shows a marina on what is locally called Big Lake but is actually a backwater of the main channel of the Mississippi River. 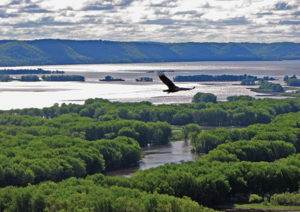 A turkey vulture soars over Mississippi River backwaters in the Driftless Area. 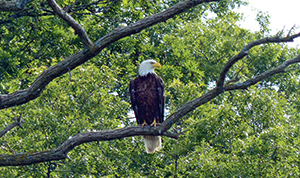 These birds are humorously referred to as a “tourist eagle” by local birders as visitors commonly mistake them for the statelier American bald eagle. Leaning on my front deck railing last spring, watching the last of the winter ice floes drift down the Mississippi River, I saw a large bird lift off from an island straight ahead. The American bald eagle, a common sight here in northeast Iowa, gained altitude heading my way, changed course slightly, and reflected the sun off its white head and tail feathers. Behind the eagle, a long line of American white pelicans wound along, heading north. They flew single file, their own feathers bright against the dark bluffs on the Wisconsin side of the river, a thousand-foot kite tail in a lazy breeze. Hundreds of bird and wildlife species live in or pass through the Mississippi Flyway, a main avian migration route that stretches the length of the United States. Inside the flyway, this section of the state is also part of the Driftless Area, a landscape unlike any other in Iowa. Bird-watching is just one of the dozens of outdoor activities that draw people to the Driftless, which comprises parts of northeast Iowa, southeast Minnesota and southwest Wisconsin. The land escaped the last three of the four glaciers that scrubbed most of the upper Midwest into gently rolling hills. Drift—the hodgepodge of rocks and soil that glacial ice pushed along—filled in the deep valleys across the rest of Iowa, but in the northeast corner, rugged terrain remains. This area, encompassing approximately 2,600 square miles of Iowa, received the drift of only the first glacier, and that eroded long ago—hence the term driftless. Above: Panoramic view of the iconic Blackhawk Bridge, and the main channel and backwaters of the Mississippi River, near Lansing, taken from the lower overlook on Mount Hosmer. Water had a much bigger impact on this area than ice. Over hundreds of millions of years, rivers such as the Mississippi, Upper Iowa, Turkey, Volga and Maquoketa cut down through the area’s soft sandstone and limestone rock, revealing its colorful layers. Paddlers on these rivers pass towering bluffs that look like giant layer cakes. In addition to lofty bluffs, the area is pockmarked with sinkholes and caves that form underground drainage systems. This topography makes for a varied outdoor playground. Iowa’s Driftless Area can be explored from the top of its bluffs to its river valleys to the underground bottom of its caves. An American bald eagle perches on a limb above the Upper Iowa River along its Chimney Rock stretch, northwest of Decorah. 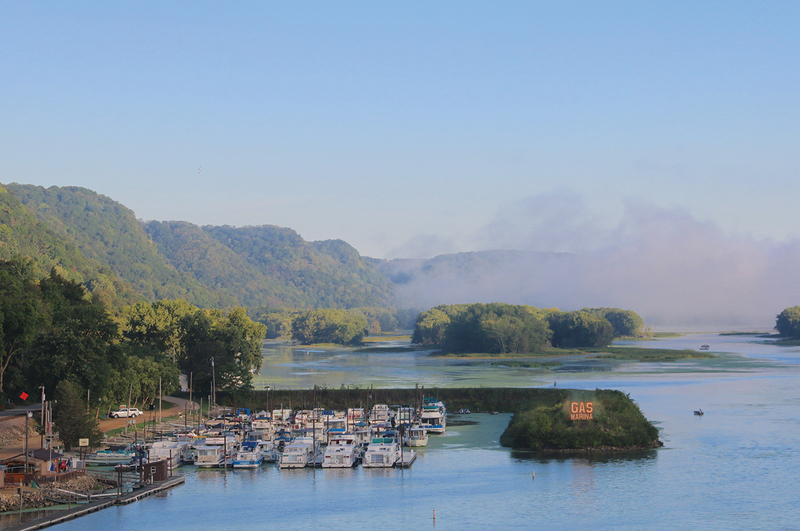 Driving the Driftless Area Scenic Byway is a good way to take in the scope of the scenery. The byway traverses 100 miles through Allamakee County’s bluff-lined river valleys and along twisting ridge-top roads. On U.S. Highway 18 east of downtown Postville, a brightly colored Iowa Byways sign points out the turn onto the Driftless route. A gravel portion of the route follows the Yellow River past cattle farms with weathered red barns, then climbs steeply to reveal a vista of distant hills, receding in fading shades of blue-gray. Turning north from the river, the byway takes County Road B25 through Yellow River State Forest, with options for camping, picnicking and hiking the heavily wooded hills. The byway first comes to the Mississippi River at Harpers Ferry. The Driftless route overlaps the Great River Road byway for about a mile and climbs a final gravel road into the bluffs north of town, zigzagging back west. Big-sky and farmland views along Elon Road stretch for miles as drivers weave along one of the area’s highest ridges into Waukon, the Allamakee County seat, home to the spacious County Home Park, with picnic areas, walking trails and a fishing pond. Just over a mile north of town, past the only stoplight in the county, a renovated barn houses the Green Valley Getaway bar and grill. The byway continues northeast to Lansing along state Highway 9, traveling another scenic ridge. Farms fall away like a quilt on either side before the road rolls down to the riverside town of Lansing. The Tiki Bar at the marina on the north edge of town is a popular place to watch boats, and Lansing’s Mount Hosmer City Park offers spectacular views of the river valley. The byway heads north from Lansing on state Highway 26, with views of river backwaters and avian wildlife all along the way. Almost to the Minnesota border, the route turns west again, hugging the Upper Iowa River between wooded bluffs, ending up near Dorchester, a town renowned for its trout fishing. A short drive south on state Highway 76 puts travelers back in Waukon. Outside of the byway, hills along the Mississippi River south of Harpers Ferry provide other impressive views. The tallest bluffs in northeast Iowa are between Guttenberg and Pikes Peak State Park (near McGregor), with Pikes Peak the tallest at 500 feet. The park is named for Zebulon Pike, sent to explore the Mississippi Valley in 1805 after the Louisiana Purchase, and overlooks the confluence of the Wisconsin and Mississippi rivers. Effigy Mounds National Monument, three miles north of Marquette on Iowa Highway 76, is the state’s only national monument. The park holds 206 known effigy mounds constructed by tribal cultures for ceremonial and burial purposes. Albert LeBeau, cultural resource program manager with the National Park Service, says the mound building period started about 2,000 years ago and lasted for about 1,500 years. Some mounds in the monument are simple conical or linear shapes, but 31 take the form of animal effigies such as bears and birds, reflecting their builders’ kinship with nature. Archaeologists have not determined the purpose of the mounds that do not contain burials, but some think they mark celestial or seasonal observances. LeBeau says human remains have been found in some of the mounds, as well as obsidian tools from the Yellowstone National Park area, flint tools and projectile points from the Knife River region of North Dakota, copper from Michigan’s Upper Peninsula and shells from the Gulf Coast. “It’s unclear if the local people traveled that far or obtained the items through a trade network,” LeBeau says. Well-maintained but often steep hiking paths wind through blufftop woodlands and around the mounds, including lookouts with expansive views of the Mississippi Valley. Cross-country skiers and snowshoers use the paths in winter. In the north unit, start at the informative visitor center and hike a two-mile loop, or continue up to seven miles round trip, stopping at scenic river overlooks along the way. The south unit offers hikes inland up to four miles long with the monument’s largest grouping of bear-shaped mounds. A hidden gem, the Sny Magill Mound Group (south of McGregor off Clayton County Road X56), has more than 100 mounds. Yellow River State Forest, consisting mostly of hardwoods, is Iowa’s largest block of timber. The Paint Creek Unit offers seasonal camping, snowmobile and horse trails, canoeing, camping, and fishing (six miles of stocked trout streams), in addition to year-round hiking trails that climb bluffs and plunge into ravines and grassy bottomlands. State Forest Road leads into the park 11 1/2 miles north of Marquette, off of Iowa Highway 76. Guttenberg’s two-mile river walk provides insight into the life of a historic Mississippi River town as well as great views over the water and Lock and Dam No. 10. The former lockmaster’s house is open to visitors, and an aquarium showcases the types of fish that live in the Mississippi. Driving to Guttenberg along the Great River Road is worth the trip for the scenery alone, offering majestic views in any season. The small rivers of the Driftless and Mississippi backwaters are ideal for kayaking and canoeing. One of the most popular paddles is the Upper Iowa River Water Trail, which meanders 136 miles from LeRoy, Minnesota, to New Albin, Iowa. There are many put-ins along the way for shorter trips. Stretches northwest of Bluffton run between colorful bluffs and striking waterfalls. The Upper Iowa is generally a lazy float, with a few short riffles. On warm days, tubers enjoy the float too. An excursion boat ride is an easy way to experience the big river. Maiden Voyage Tours, open Memorial Day through October, offers 90-minute rides on a 49-passenger boat leaving from the McGregor landing. Driftless geology is on display up close at Maquoketa Caves State Park, south of Dubuque off of U.S. Highway 61. The park’s 13 caves range widely in shape and size, from Dancehall Cave—with walkways and lights—to the tiny Dugout Cave. All are linked by more than seven miles of trails and boardwalk through dense woodlands. Interesting geological formations along the way include a 50-foot-high natural stone bridge over Raccoon Creek and a 17-ton rock balanced on another enormous boulder. Many of the caves were formed through a “solutional process,” says Scott Dykstra, the Iowa Department of Natural Resources ranger assigned to Maquoketa Caves. As rain filtered through the drift, Dykstra says, its makeup changed to a weak carbonic acid, which slowly eroded the rocks. Also, the water table in the area used to be much higher, with underground rivers and streams that eroded the limestone. Then the water table lowered and the caves opened up to where people can enter them. There are known caves throughout the Driftless area and probably many more undiscovered because they don’t have access points, he added. Arrowheads and pottery made by early cultures have been found in some of the caves, particularly Dancehall Cave. Dykstra speculates that native peoples visited the caves seasonally, hunting certain animals or harvesting berries and camping there. Visitors can download a map of hiking trails and caves from iowadnr.gov and should bring a flashlight to navigate the caves. The park was closed for most of 2018 to complete an upgrade to its campground electrical system and to repave the main park road, but the caves are generally open mid-April to mid-October. Closure in the winter allows the bats that live in the caves to hibernate undisturbed. Hiking trails and campgrounds are open year-round. The Driftless Area Education and Visitors Center, just south of Lansing along the Great River Road, helps visitors understand the lay of the land. The center opened in 2017 to explain how the Driftless Area came to be, the types of wildlife native to the area, and how people have survived along the Mississippi River for centuries. Exhibits include videos about the region’s caves, displays of native reptiles, historic photos and maps of Allamakee County, a collection of tools used by indigenous peoples, and wooden fishing and clamming boats that were used on the Mississippi. Two covered decks offer views north toward Lansing and its historic Blackhawk Bridge. A Canadian-Pacific freight train may rumble by on the rails below or a towboat may head downstream, pushing a tethered load of up to 15 barges. 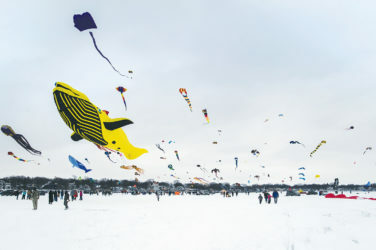 Fishing boats enter the river from the boat ramp next to the center, and in summer pleasure boats zip by, pulling skiers and inflatables. And overhead, in the flyway, soar eagles, pelicans, herons, egrets and more, feathers flashing in the sun. 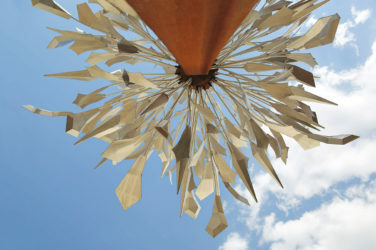 Creative placemaking initiatives use art as inspiration for revitalizing communities.